A four-year-old and her grandfather who died in a collision in the Highlands were on their way to the funeral of a relative also killed in a crash. 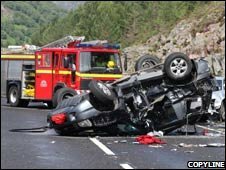 Paul Anderson, 48, from Lancashire, and granddaughter Samantha Carr died on the A9 on Saturday. His wife and another granddaughter were injured. They were travelling to the funeral of Mr Anderson's niece, Vicky Pickering, 27, who died in a crash on 4 July. Vicky died in a crash in Lancashire on her way to her home village, Gairloch. The 27-year-old joined the Navy after leaving Gairloch High School and worked at HMS Nelson Naval Base in Portsmouth. She was killed along with her friend, Zoe West, on the M6 in Lancashire, while on their way to surprise her mother Glenys Pickering - Mr Anderson's sister - on her 50th birthday. The deaths have meant Mrs Pickering has lost a daughter, brother and grand-niece in about a fortnight. Vicky's father, Colin, said: "When you think things can't get any worse, they do. "We are devastated by the chain of events." Paul Anderson, his wife Mel, and two granddaughters - four-year-old Samantha and three-year-old Emma - were driving along the A9 between Dalwhinnie and Newtonmore, when the crash happened. The family were on the way to pay their last respects to Vicky, whose funeral was on Monday. The collision, which happened at about 0920 BST, involved a 4x4 towing a caravan, two vans and a car. 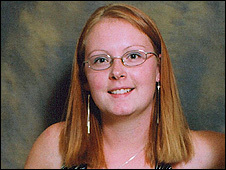 Samantha Carr died at the scene. Her grandfather was flown by air ambulance to Raigmore Hospital in Inverness, but was pronounced dead on arrival. Mel Anderson and the three-year-old girl were taken to the same hospital and were said to be in a stable condition. The crash happened 400 yards south of the end of a stretch of dual carriageway. There have since been renewed calls for the A9 to be dualled completely between Inverness and Perth.